An important tool in both operating model work and organisation design work is the decision grid. The format is simple. Place the decisions you want to consider down the left hand side of a table and the organisation roles (like CEO, CFO, etc) that are likely to be involved in the decision along the top of the table. 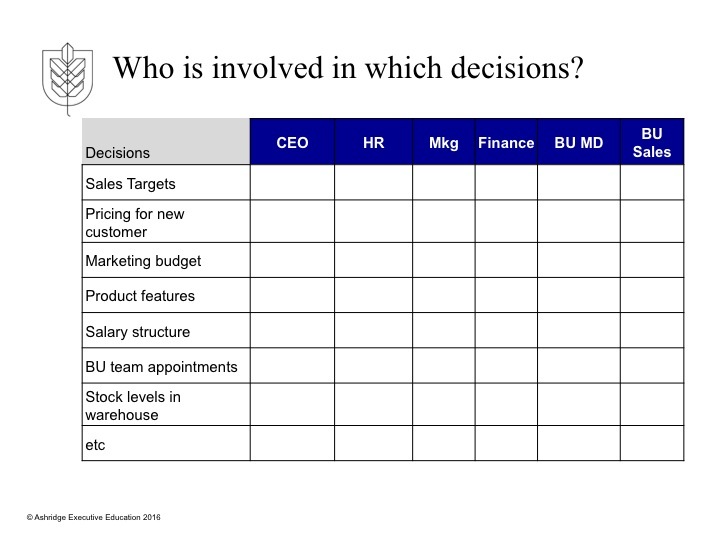 This gives you a grid of boxes where decision meets organisation role. In these boxes you then place a letter (or words) that describes the relationship that that organisation role has in the decision. The best known mnemonic is RACI – standing for Responsible, Accountable, Consult, Inform. But there are other mnemonics that I find more useful. So this article is about which mnemonic and how to get the best from the tool. 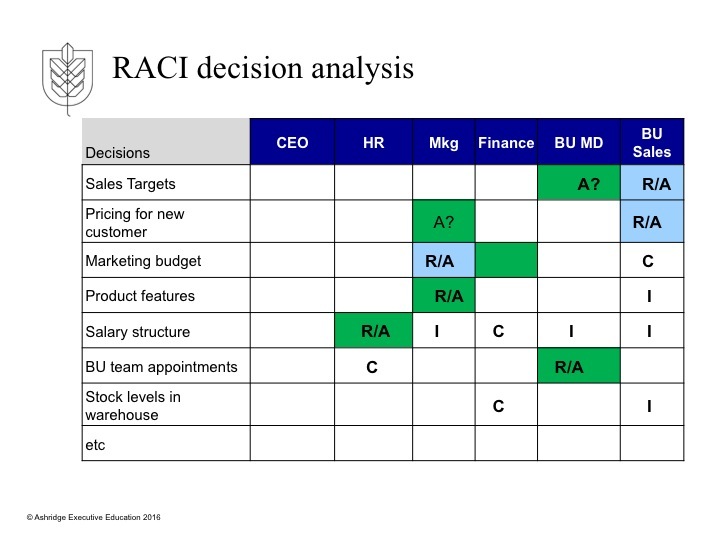 The RACI mnemonic was developed to help people think about activities rather than decisions, for example, the activity of producing the annual report or the activity of developing new customers. In this context, Responsible means the person who is responsible for doing the activity: the project manager for the annual report or the business development manager for new business. Accountable means the person whose job it is to make sure that the activity is done and done well: the CFO typically for the annual report and the head of business development for new business. Another way of thinking about Accountable is “who is the most senior person who will get fired if this activity does not happen or is done badly”. There is a long tradition in academic literature that argues that responsibility and authority should be aligned. This means that the person who has authority should either also be responsible or should have the person who is responsible reporting to him or her. RACI has been developed out of this tradition, with the word accountable standing in for the word authority. So it is for this reason that R and A are the first two letters of RACI. The last two letters standing for Consult and Inform do not need much explanation. They enable those related to the activity, but with limited power over the activity, to be acknowledged. RAPID was developed by consultants at Bain & Co in order to create a focus on decisions and decision processes. There is a famous Harvard Business Review article titled “Who has the D?” by Marcia Blenko (if I recall correctly). The D stands for Decide: who is the person with the authority and power to make the decision? For example, who decides what the sales targets should be? Or who decides what text should be included in the Chairman’s statement in the annual report? For the latter, presumably it is the Chairman. For the former, is it the head of sales or the head of finance or the CEO or …? You can see from these examples that part of the skill of using this tool is to define the decision quite precisely: so it is possible to pin it on one of the people involved. R stands for Recommend. Often, in a decision process, the person who is responsible for doing something (the P for Perform) is also expected to make a recommendation about what decision should be made. This recommendation is then approved (decided) or not by a boss or the leader of some committee. I stands for Input: a person who is expected to have some input into the decision. For example, the CEO might have some input to the Chairman’s statement, but not decide or recommend. The regional heads of sales and the financial controller might have some input into the sales target. A is the most difficult letter in RAPID. It stands for Agree. It is mostly used where there are constraints on the decision such as legal or financial issues. A person who holds an Agree role should sign off the decision based on whether it meets some standard, for example it does not break a law or require more money than is available. In other words the remit of the person with an Agree role is quite limited. Agree does not give the person the power to question the logic of the decision or recommend alternative points of view (but of course it does not stop someone offering their opinion.) It just means that the person holding the D can ignore the opinion offered unless the opinion is limited to the specific standard or requirement (such as is it legal?). There are quite a range of other mnemonics in part because popular tools like RACI and RAPID both have weaknesses. Neither addresses the hierarchy of mangers or governance bodies above the decision maker, each of which typically has the power to overrule the decision maker. Neither has letters for all the possible roles connected with an activity or a decision. RASCI, standing for Responsible, Accountable, Support, Consult, Inform, is one alternative. RAS standing for Responsible, Approve, Support is another alternative. 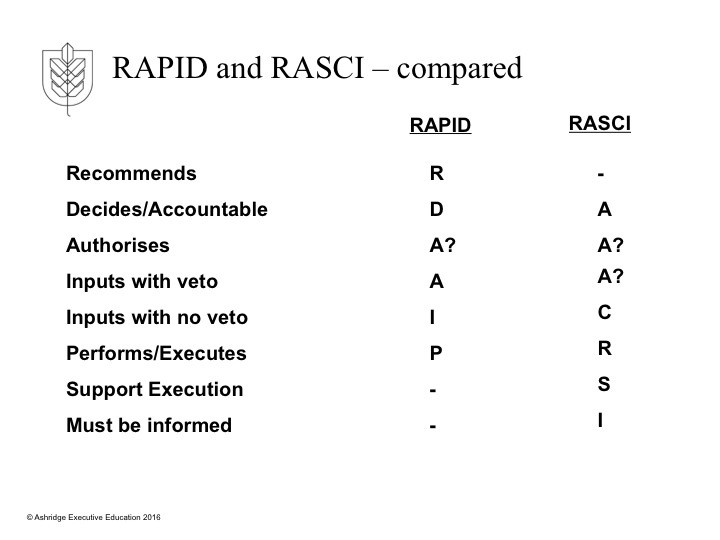 Those working on operating models or organisation designs should not feel constrained by RACI or RAPID. Be comfortable creating your own set of letters to address your particular situation, whenever one of the popular mnemonics does not address all the issues being raised or addresses more issues than it is useful to raise. 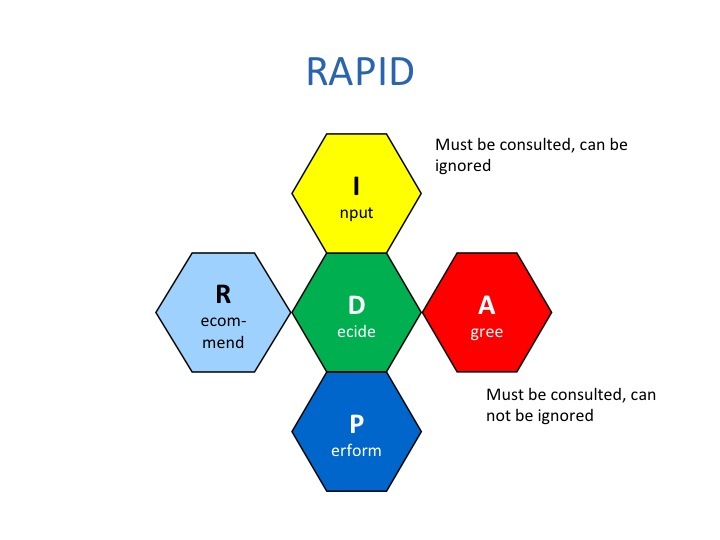 This entry was posted in Decision grids and tagged activities, Decision grids, RACI, RAPID. Bookmark the permalink.